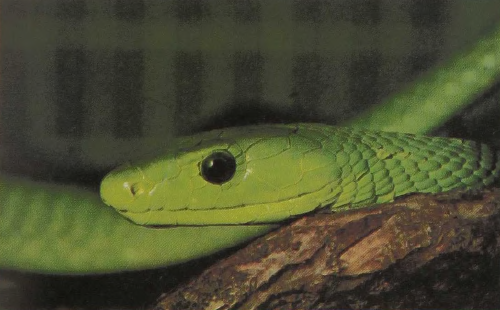 Four species of the arboreal mambas range across most of Africa. They are mainly tree and bush snakes that rest up in tree tops where they feed on birds, lizards, and arboreal rodents. They have the reputation of being fast, vindictive, and deadly. Only the last attribute is probably correct. Their speed on the ground probably does not exceed six miles per hour for a large specimen. Even if they climb somewhat more slowly than this, they do move much faster in a tree than would a man. Though relatives of the cobra, they can move their fangs forward for a bite, and their long head and large mouth insure that good contact is made with the prey. Like numbers of several groups of snakes, the males engage in ritual combat during the mating season, rising up and intertwining their bodies, wrestling across the ground, but never biting or using their fangs. The mambas are egg-layers. This mamba reaches a length of about 7 feet, but other species may measure more than 10 feet.